I find it fascinating how, since I’ve become more involved in the wine industry, how wine has influenced other aspects of my life. Perhaps I am alone in this, but somehow I suspect not. What I mean is that the appreciation for wine seems to lead into interests (or at least awareness) of other things in life to which you may have never payed that much attention. Perhaps potatoes can’t reflect their terroir quite as well (or maybe they do?) but there are other things that can. Fruit growers here in the Okanagan valley all know that tree fruits taste different depending on where they are grown. Cherries grown in Osoyoos taste different than those grown in Oliver, Penticton, or Kelowna. So do peaches and apples. But fruit products are always sold by variety regardless of their provenance and so most consumers, including myself, don’t know that the 3 apples in the shopping cart could all come from 3 wildly different orchards. There are other products that do come from a ‘place’ the same way that wine does. Honey is one of them as can be a fascinating and as healthy for you as wine. The farm I grew up on had a neighbor who had bees and made honey. We bought honey from him by the bucket until he closed up shop and moved. We didn’t eat much honey after that because I remember the store-bought honey did not taste the same and gradually it left our diet. Living on the coast, I was treated to my first honey-tasting at a farm in Port Coquitlam that also sold pumpkins. We were taking my son to the pumpkin patch before halloween and the farm also had a few different kinds of honey. “What’s the different between all those honeys?” I remember asking. That’s when the toothpicks came out and I was taken through a tasting of all of their honeys with explanations about each one. Whatever kinds of flowers are most common near the hives will determine the flavours in the resultant honey. There was a huge difference in viscosity, color, intensity and complexity of flavours. 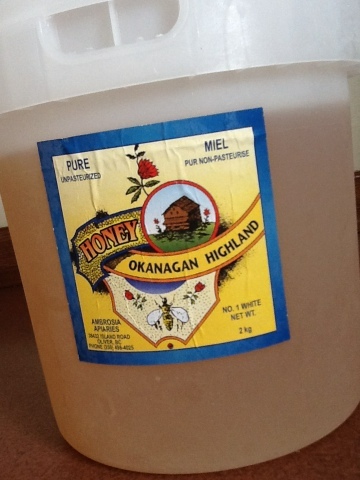 I remember being particularly enamored with the wild flower honey and bought a jar of that to bring home. But the experience of tasting the different honeys stayed with me from then on. Though this was early on in my wine industry career, I’d been learning about and appreciating wine for some years before that day. Not long after that, I attended a wine tasting at Douglas College that also featured a table of different single-malt Scotch whiskies and another table that featured an assortment of balsamic vinegars. There was a world out there to be tasted and it all started for me because of wine, which until that time had been the only thing that I’d really tasted as an adult that had so many different variations in flavours, intensities, and complexities. The highly processed and homogenized foods products that I’d been eating since I was a teenager were suddenly less interesting and, as I’ve more recently discovered, completely unhealthy for me. Wine became the gateway for a whole new world of taste and ultimately health. Perhaps it is this connection that wine has been providing for me: the last un-frayed thread on a rope that attaches me to the natural world. If it breaks, it will let me fall completely into a world where all foods are processed, genetically modified and/or synthesized beyond recognition. It’s the awareness of the natural world inherent in wine production that has lead me to further seek out and appreciate other foods that are equally as natural and beneficial which I may have otherwise taken for granted or ignored completely. Whatever it is in wine that has made me more aware of other foods that I eat, I’m glad for it.